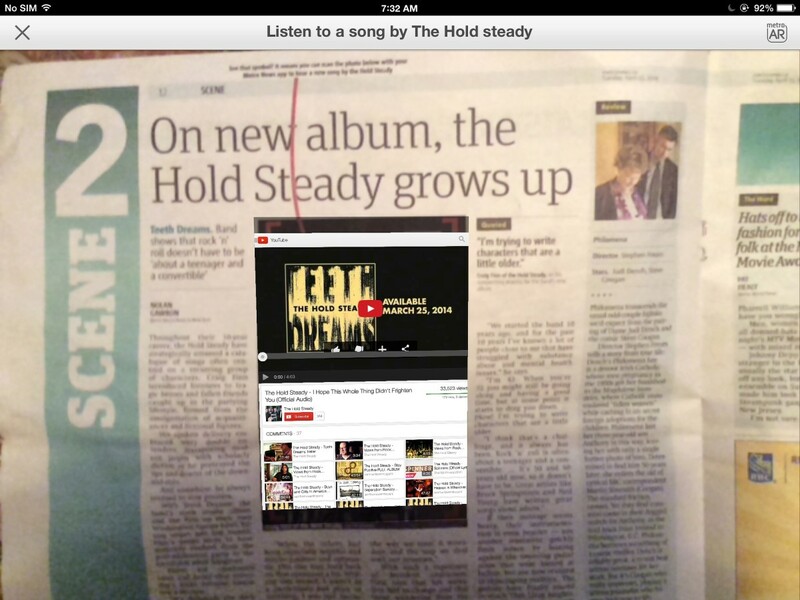 Augmented reality is an interesting feature in newspapers that takes readers beyond the printed page. It enables people to see a video, animation, or other unexpected content that is apparently located on a page of their newspaper. The illusion is created when an augmented reality program and the camera software of a smart phone or tablet work together. The newspaper must be viewed through the camera of the mobile device in order for the illusion to work. In addition, the device must be connected to the Internet. The video is superimposed on the photo, as seen on my iPad screen. Augmented reality or AR is the process in which a digital image is superimposed on a scene from the real world, creating a view that is part reality and part virtual reality. 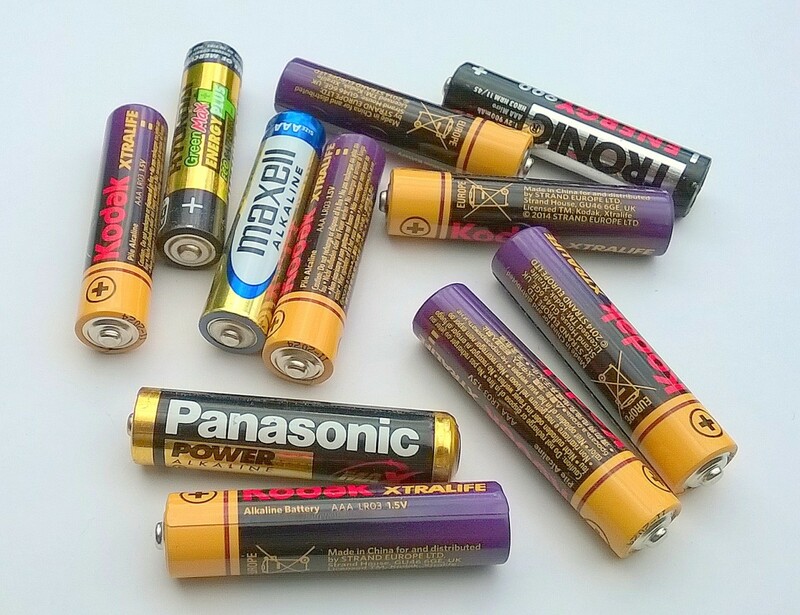 It's used in the environment as well as in newspapers and other types of print media. When augmented reality is used with a newspaper, a photo in an article is scanned with the camera of a mobile device. The AR software identifies the photo and then loads related digital content. 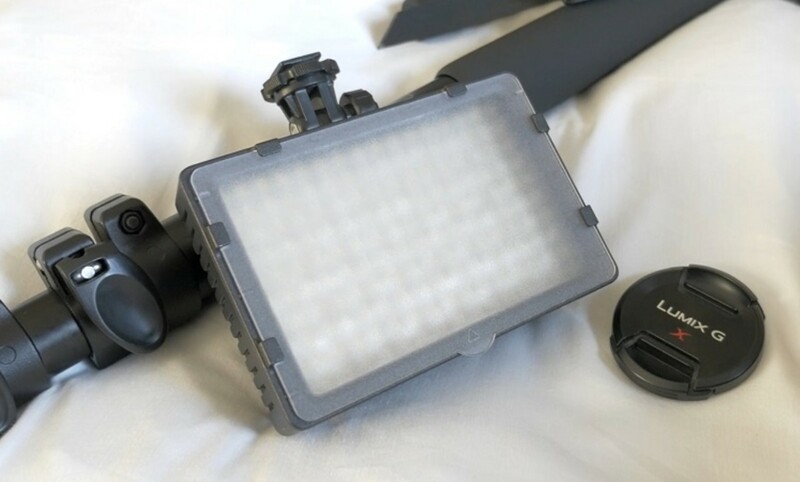 The content is displayed in the device's camera view. It's often positioned over the scanned photo so that the digital content appears to have replaced the photo. Although the content that is loaded is frequently a video, there are many other possibilities. 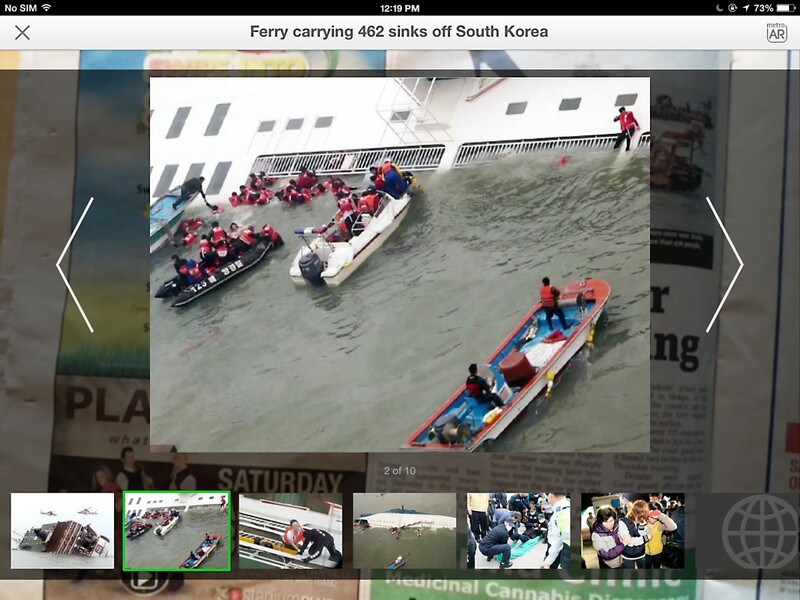 A photo gallery, the latest news updates or sport scores, related social media information, educational animations, additional facts, a relevant map, a restaurant menu, a competition entry, or a reservation page for a special event are all possible uses for newspaper AR. Newspapers around the world have added augmented reality in an attempt to enhance their product, although this has sometimes been done on a trial basis. The newspapers want to attract new audiences—especially young people—to increase their waning number of readers. Two papers in my area have used AR in recent years. All of the pictures in this article were taken by me as I explored augmented reality in the Metro and Burnaby NOW newspapers. The Metro is a free weekday newspaper in the Greater Vancouver area that for a while included daily AR content. The full name of the newspaper is the Vancouver Metro to distinguish it from the Metro newspapers published by the same company in different cities and countries. At least some of these related newspapers have also used AR. 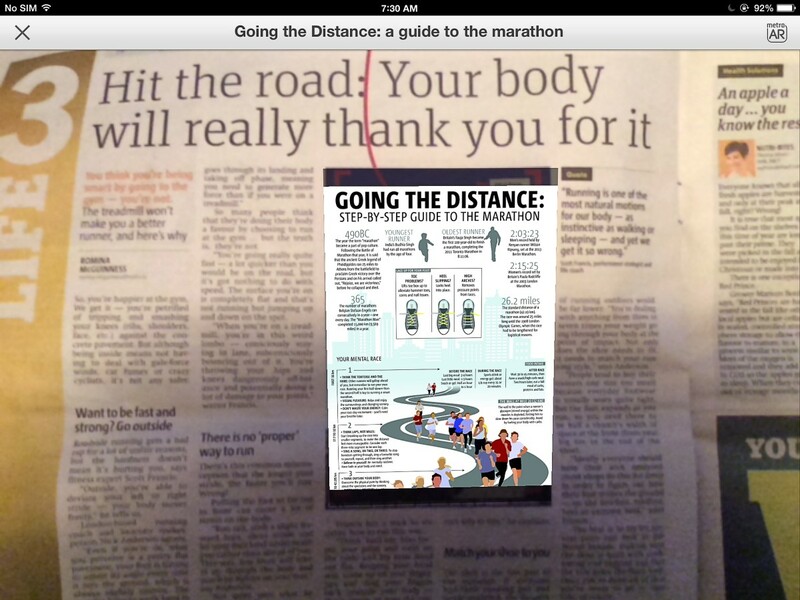 In my exploration of the newspaper's augmented reality features I encountered YouTube videos, movie clips, videos that seemed that seemed to have been created by the newspaper, extra photos, photo slide shows, and an informative poster about training for a marathon. 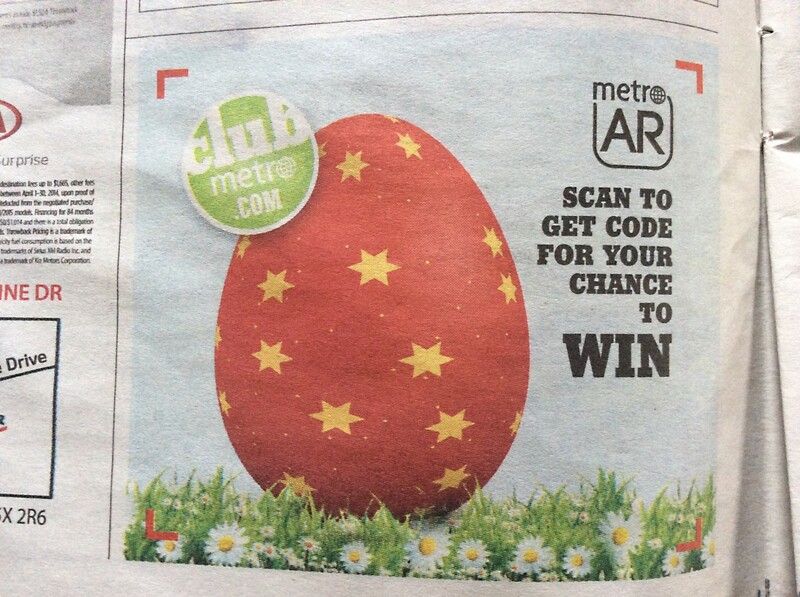 The newspaper also offered a competition code that was available through AR. The augmented reality was provided via Metro's own app for mobile devices. Burnaby NOW (part of the NOW newspaper group) is a free community newspaper that is published twice a week. At one time, each issue offered AR features similar to those of the Metro newspaper. 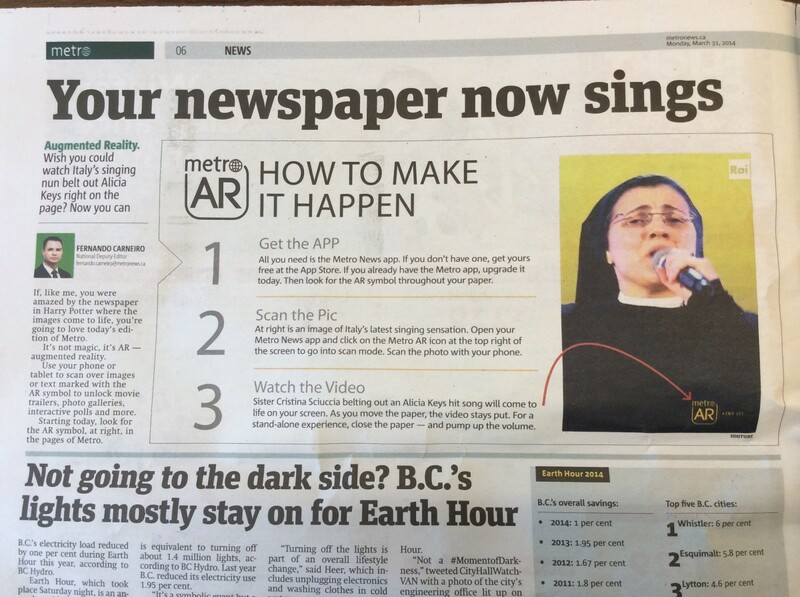 The paper also enabled people to buy concert tickets through augmented reality. Burnaby NOW used the Layar app to provide its AR. The photo has been scanned and is now covered with a YouTube video of Sister Scuccia singing, as viewed through my iPad. A photo gallery is loaded in this augmented reality feature about golf. 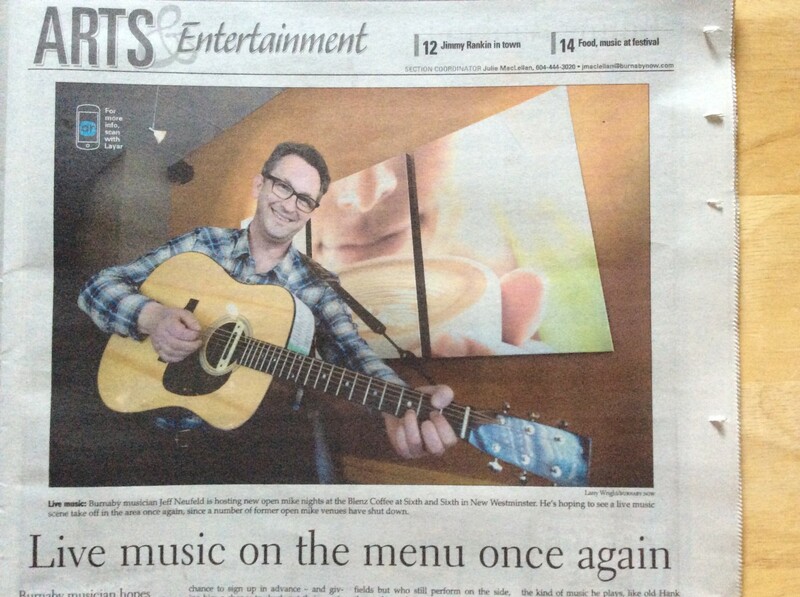 This edition of the Metro newspaper allowed someone to read an article about the Hold Steady and then listen to a sample of their latest music. The Tokyo Shimbun is a Japanese newspaper that has used AR to change articles aimed at adults into easily understandable articles for children. Animated cartoon characters, color, pop-up headlines, and a simplified alphabet make the newspaper useful and entertaining for a child. In Australia, one newspaper group has used an AR app called News Alive to enable readers to explore a 3D version of buildings. 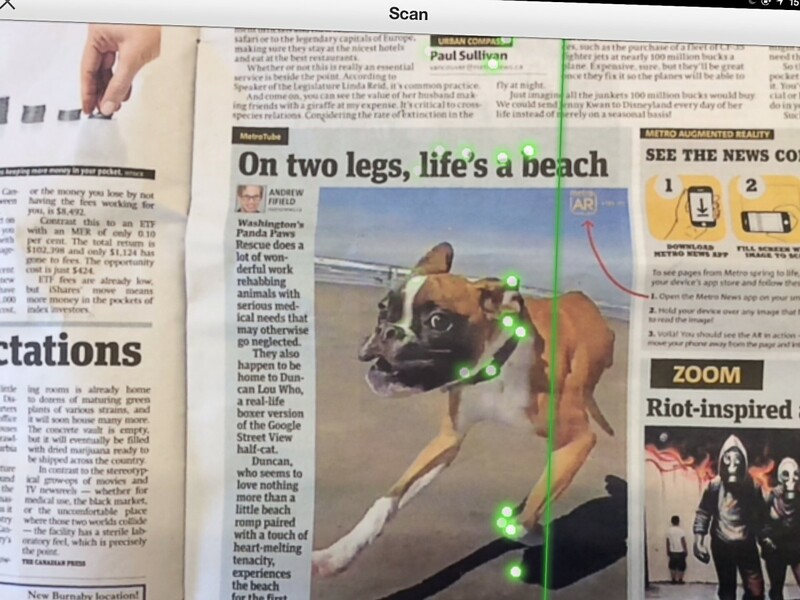 How Does Augmented Reality in Newspapers Work? When the Metro published its first newspaper containing AR content it likened the newspaper to the ones appearing in the Harry Potter movies. In these newspapers, moving scenes appeared on a page containing otherwise static content. This type of newspaper would be wonderful in real life, but it doesn't exist (yet). The appearance of movement on a page of today's newspapers is a trick that requires special equipment. The reader must have a smartphone or tablet with a camera as well as an Internet connection in order to use the AR features of a newspaper. 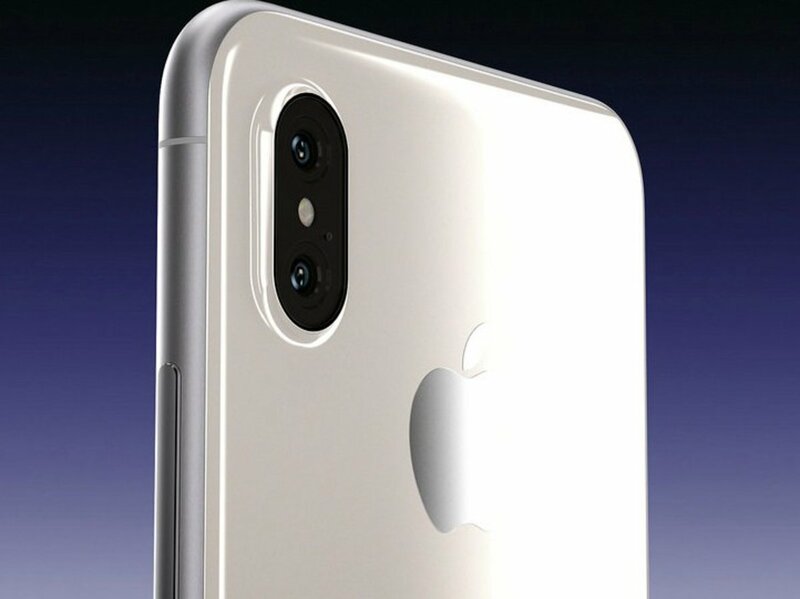 In addition, the augmented reality software must be able to link to the software controlling the camera of the mobile device. This should be no problem when using an iOS or Android device. 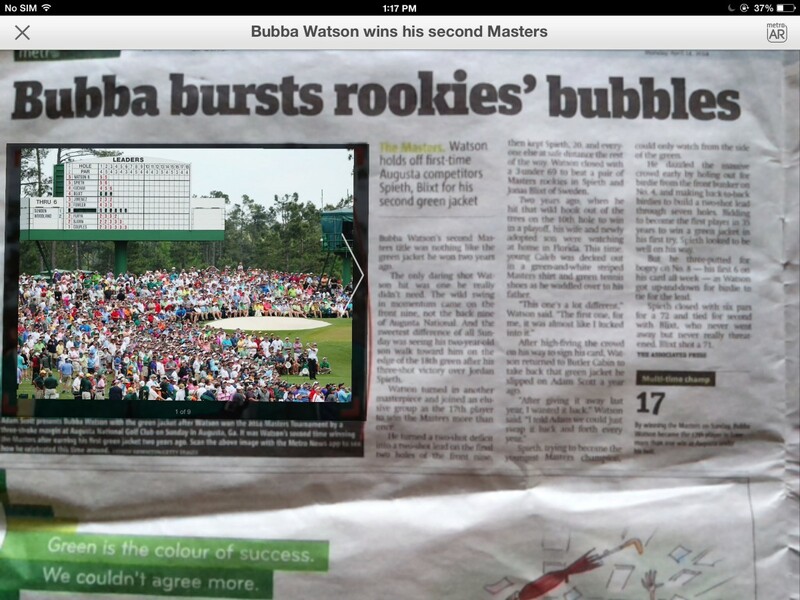 Augmented reality in a newspaper works via image recognition. With the aid of the camera app in the mobile device, the AR program identifies a photo and loads the digital content that is linked to that photo. 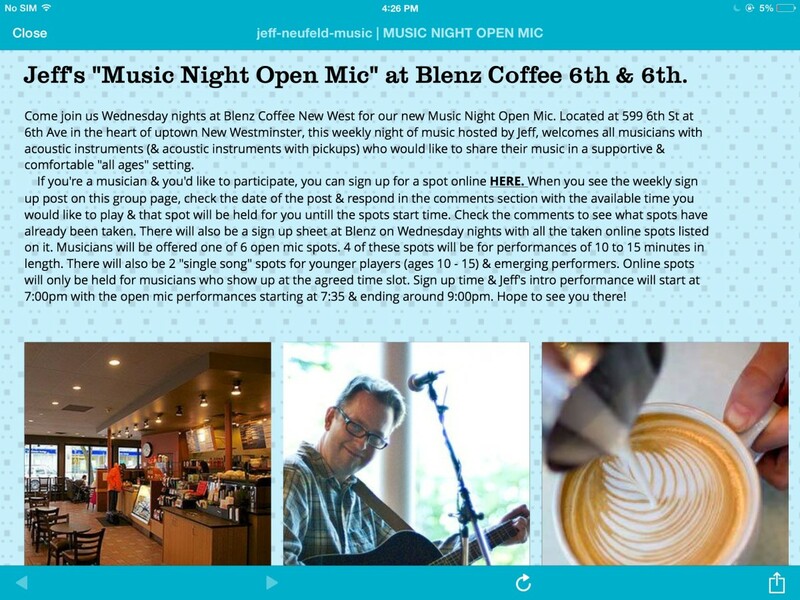 As viewed through the camera, the linked content often appears as an overlay on top of the image that was scanned. 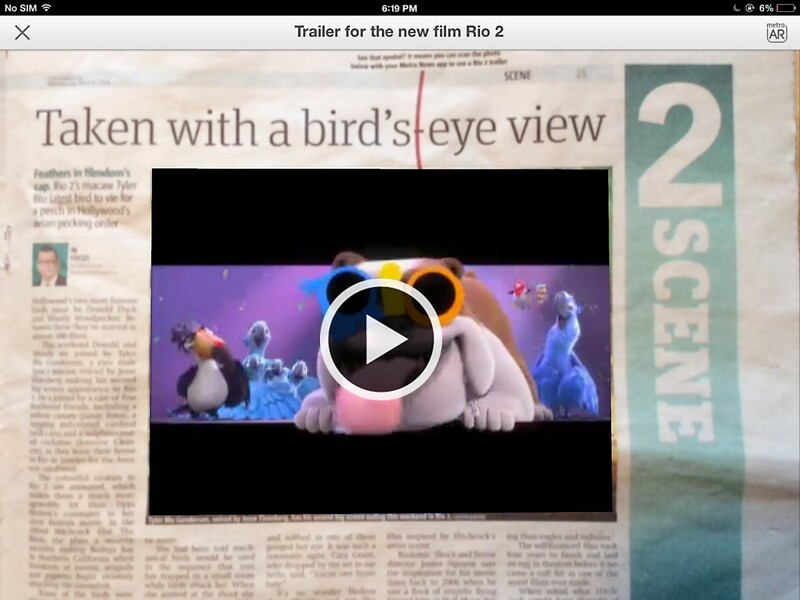 If the digital content is a video, it does give the newspaper page a slightly Harry Potter-like appearance as it plays. 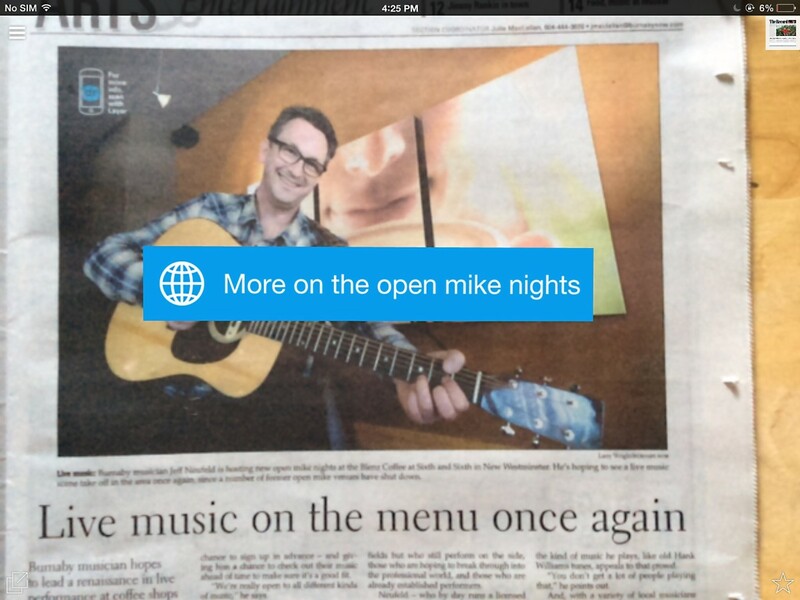 Once the content is loaded, when the mobile device is moved away from the newspaper the content stays in view. The augmented reality in my local Metro newspaper was marker based. The steps in using the AR from this newspaper on a mobile device such as my iPad were as follows. The newspaper app was available as a free download at the Apple Store. Click the AR symbol on the front page of the app. The app opens the camera application on the iPad in scan mode. Fill the screen with the photo to be scanned. The photo is automatically scanned as a vertical green line moves over the photo. Markers (the green dots in two of the photos below) are temporarily laid down as the scan line moves. Information from the markers is sent to a newspaper computer. The computer compares the information from the scanned photo with the photo information stored in its database until it finds matching data. Once a match is found, the computer performs the action that it's programmed to carry out when that photo has been identified (such as loading a particular video or slide show). 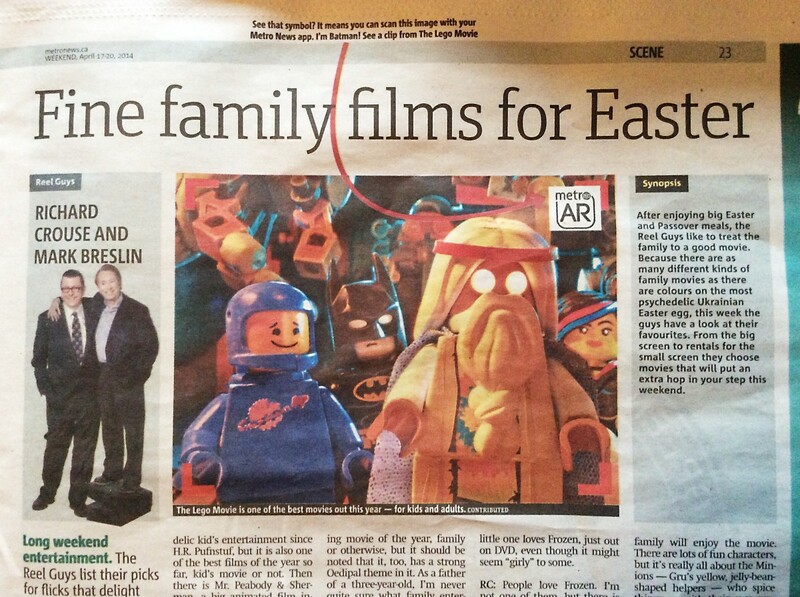 This Metro newspaper contains a photo and a description of The Lego Movie. I've zoomed in on the photo so that my iPad can scan it. Green dots (markers) are being laid down as the vertical scan line moves over the image. 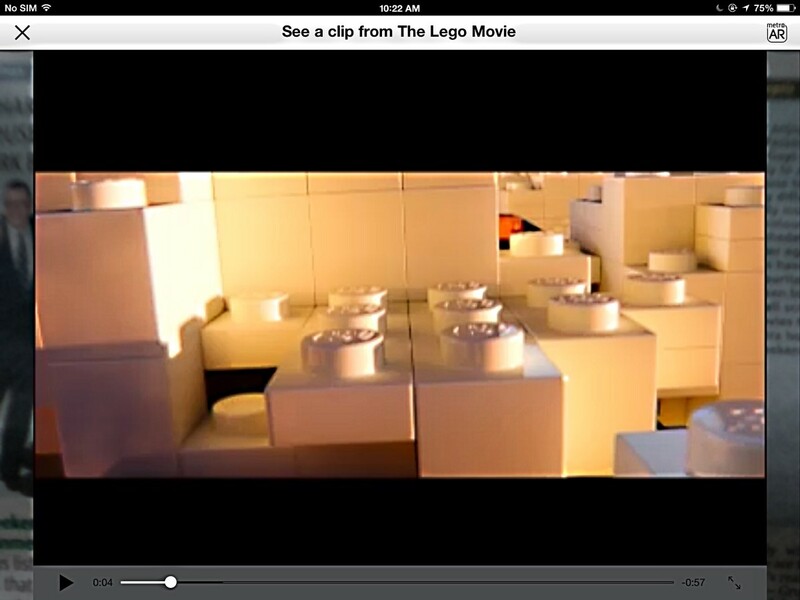 A clip from The Lego Movie has been loaded in the same position as the original photo. 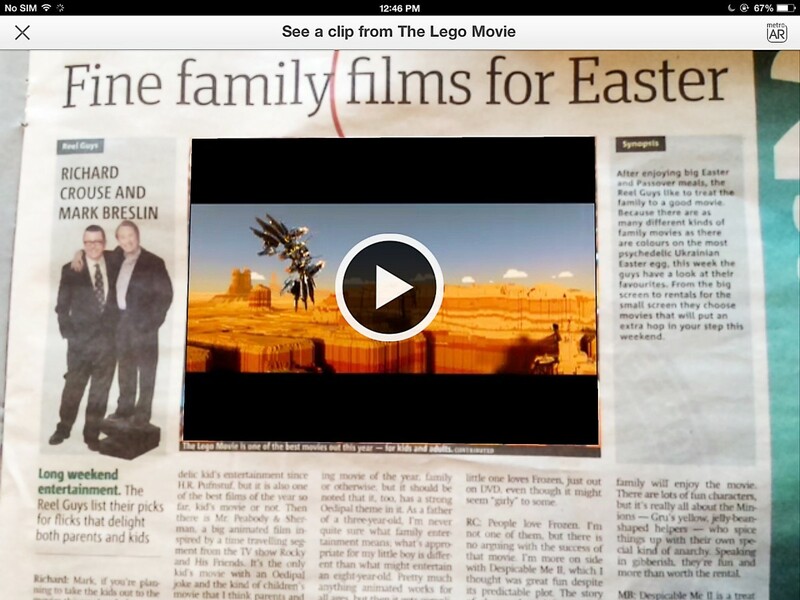 I've moved away from the newspaper so that The Lego Movie clip fills the screen. Markers have been placed on the photo of Duncan the two-legged boxer. A video of Duncan having fun on a beach loads. This process for obtaining AR content is fast when it works properly, as it often does. Sometimes the "Scan result not found" message appears, however. 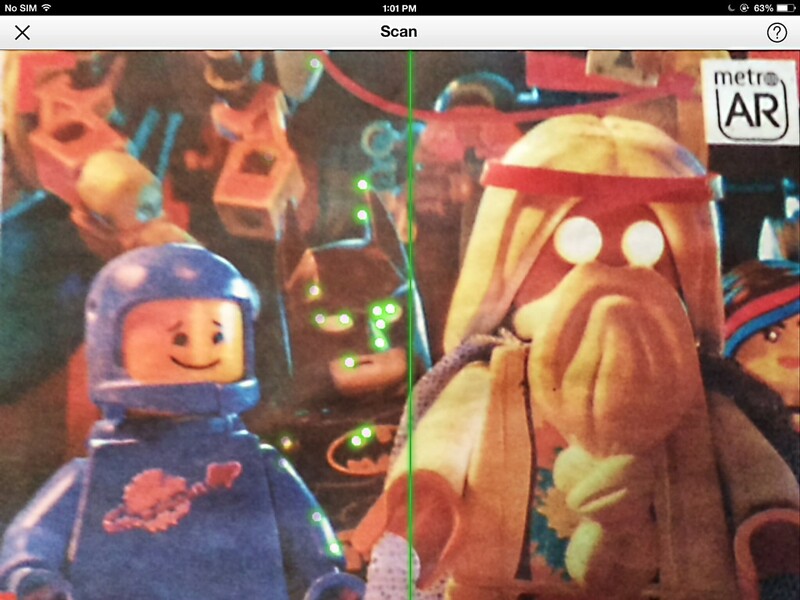 The scan line moves over the photo and markers appear and then disappear as normal, but the scan isn't successful. 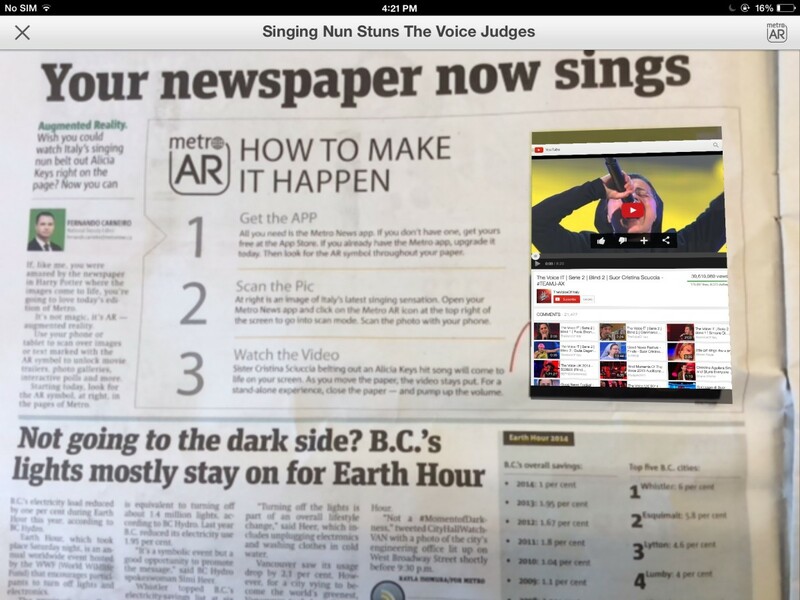 The augmented reality feature in the Burnaby NOW newspaper worked in the same general way as in the Metro newspaper. 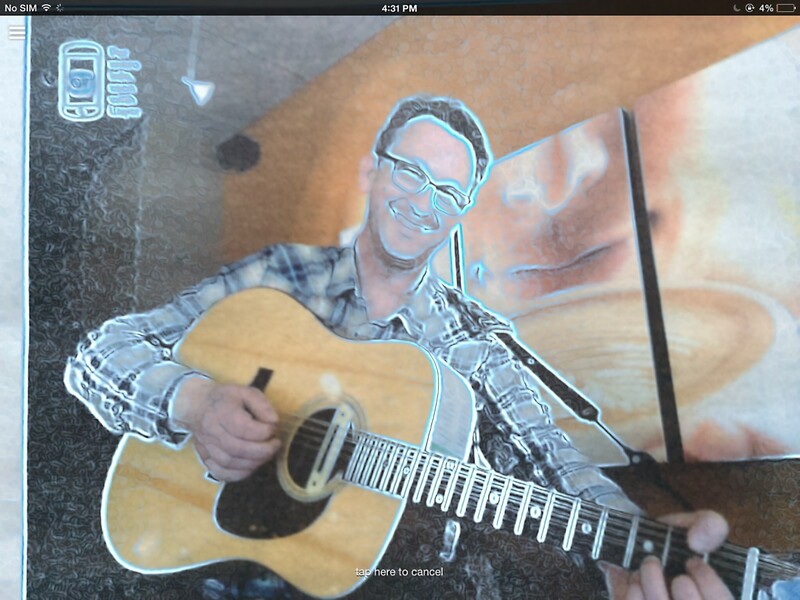 The Layar app used by Burnaby NOW examined outlines and edges in photos. It often worked very well but sometimes failed to scan successfully. When a photo scan quickly triggers interesting content to load, the AR feature is very enjoyable. When multiple scans are needed to obtain success the process is less enticing. The photo scanning and content loading procedures aren't foolproof. It's frustrating when they don't work, whatever the reason for the problem. I occasionally encountered a photo that I couldn't scan correctly, even when I tried on multiple days and under multiple conditions. The photo is being scanned. A link has been loaded. This augmented reality contains both a slide show and a video. 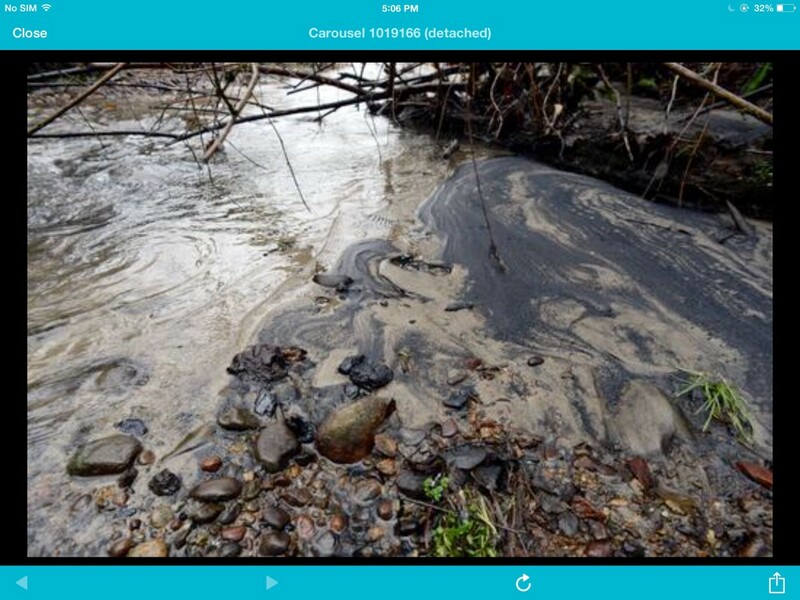 Additional photos of the coal spill are available through augmented reality. Augmented reality in newspapers is potentially a very useful feature and could be a great enhancement to them in the future. I enjoy looking at digital content linked to newspaper articles. Based on my experience, however, the technology needs to be improved. I consider the following features to be very important in order for AR in newspapers to be effective. The augmented reality feature should be easy to use, reliable, and as foolproof as possible. The scanning and content loading process should be rapid. Instant or very nearly instant gratification is necessary in order for the technology to appeal to people. 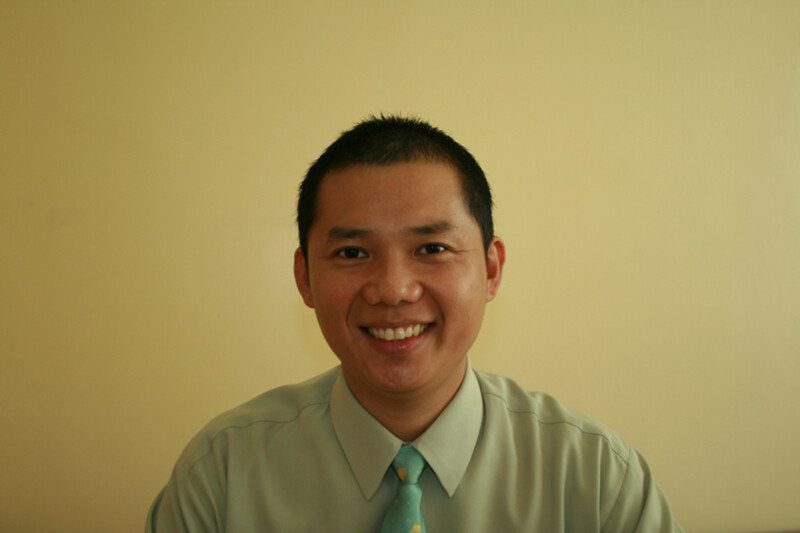 The digital content should offer added value to the print article. Ideally, the digital content should be obtainable only through the AR program and shouldn't be something that a person could find on the Internet on their own. If the content is available on the Internet and can be accessed via a web browser, it's very important that obtaining it through an AR program is a rapid and convenient process. Some people feel that the new content should contain movement or interactivity, since otherwise static material in the newspaper is simply being replaced with more static material. I don't mind seeing static digital content as long as it's rich in new information. 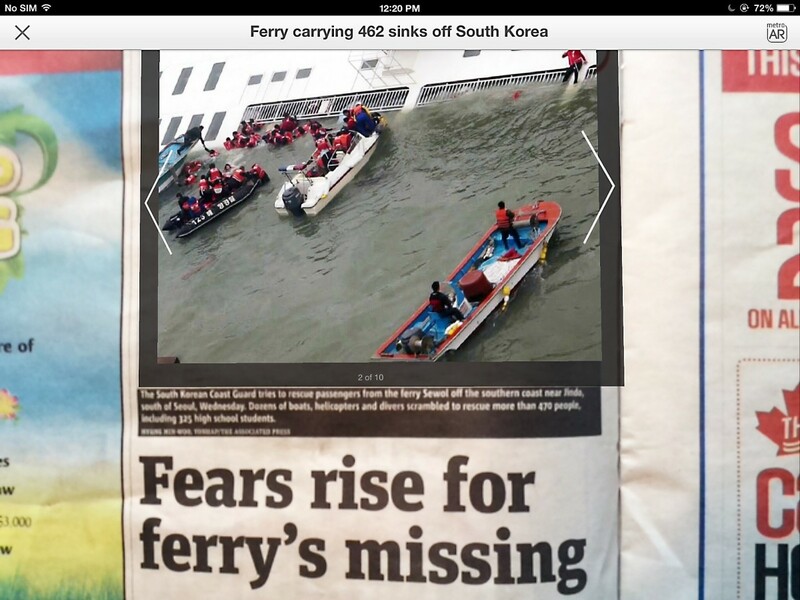 Some people feel that simply overlaying a newspaper picture with another one is not the best use of augmented reality. One question that needs to be answered is whether people will want to look at digital content linked to newspapers when they could get all their information from the Internet and dispense with a newspaper altogether. 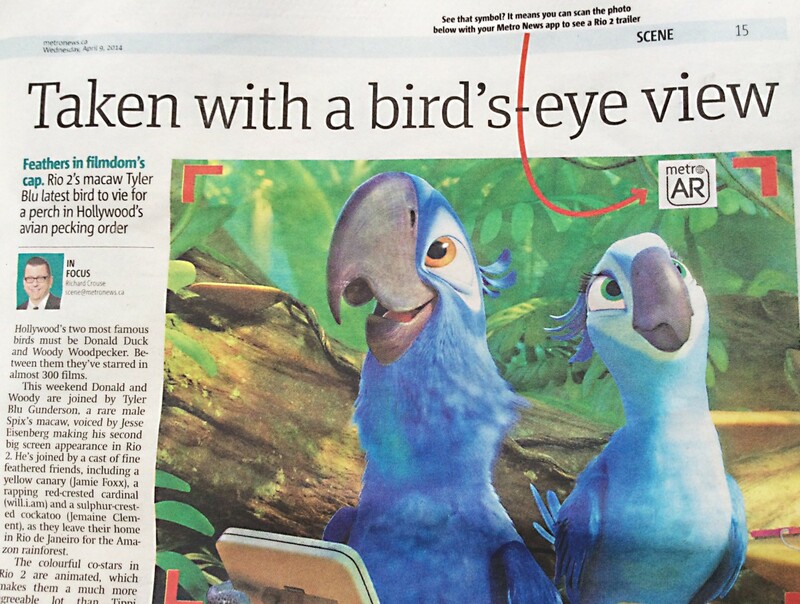 Compelling or unique content in both the paper and its AR content might help to attract readers. Apparently the attraction of augmented reality—at least as it was implemented—wasn't strong enough in my local newspapers, since the feature was dropped. Improved technology and new abilities might encourage the papers to try AR again. Other types of print media besides newspapers have used augmented reality, including the book version of Guinness World Records. Additional books and some magazines have used the technology as well. Specialized AR apps are appearing. Bing Translator for Windows Phone enables a traveler to point their mobile device at text written in another language and then read the text in their own language. The Google Translate app does the same thing. Augmented reality apps have been developed to let people learn more about buildings, cars, museums displays, golf courses, mountains, stars, and other parts of the environment. Some of these apps work by detecting location instead of by reading markers, but all display digital content in addition to real-life content. Eyeglasses that provide augmented reality seem to be increasing in popularity. The Pokémon Go game with added AR was very popular in 2016. Some researchers suspect that 2017 might be the year in which augmented reality finally lives up to its promise. There have certainly been some interesting developments lately, including the release of an AR development toolkit from Apple. Whether the new developments are helpful for newspapers remains to be seen. The potential uses of augmented reality technology are exciting, but as is the case with many other technological developments, they aren't available to everyone. Many people don't have a smart phone or a tablet with mobile Internet access. They either can't afford them or don't want to get them. In some areas the mobile devices or an Internet connection aren't available. People involved with the creation and use of AR features are getting excited about the increasing number of people with smart phones and tablets and about the potential uses of augmented reality. The problem of supplying mobile devices for AR to everyone who would like them or could benefit from them—such as children in schools—is a major one, however. In the high school where I teach, there are many "haves" with their own mobile device but also a significant number of "have nots". The school has discussed getting a class set of tablets, but we haven't done this yet because it would be an expensive purchase. The high cost is a shame, because augmented reality could be very useful in education. 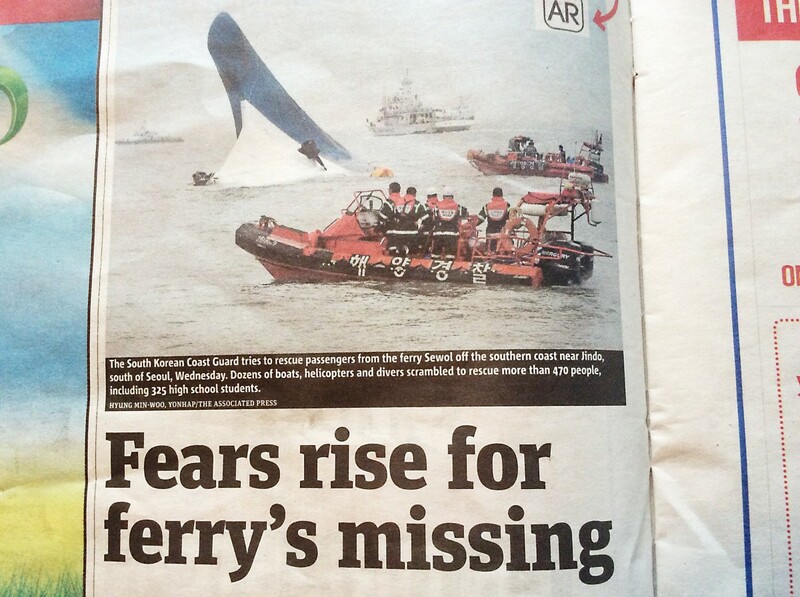 This photo of a sinking ferry is linked to AR. 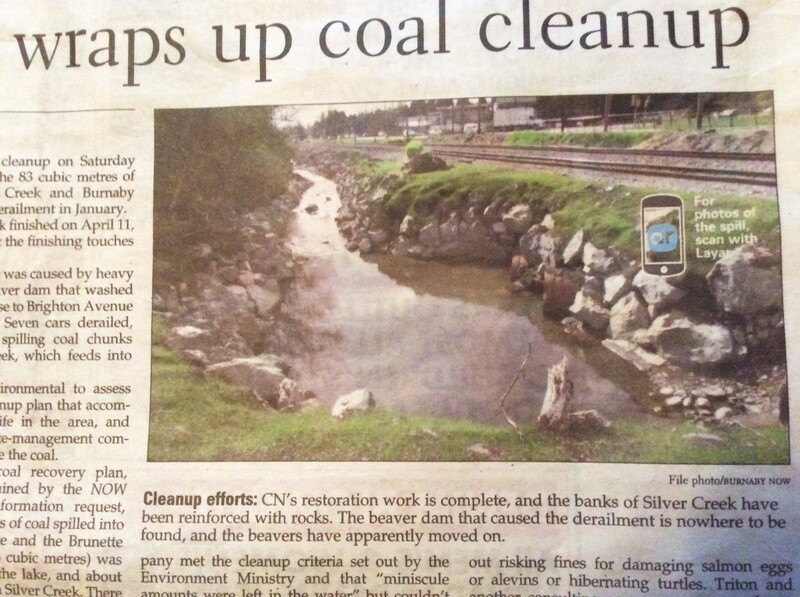 The newspaper photo has been overlain by a digital photo and a slide show. The iPad has been moved away from the newspaper, enabling the photos to be seen in a stand alone slide show. This video hasn't covered the photo on the right, which hinders the augmented reality illusion. I'm looking forward to seeing new developments in augmented reality for newspapers, other publications, and the environment and am very interested in its potential. At the moment I'm not confident in the success of AR for newspapers, however. In its present implementation, viewing the AR features of a newspaper requires a commitment that people may not be willing to make. 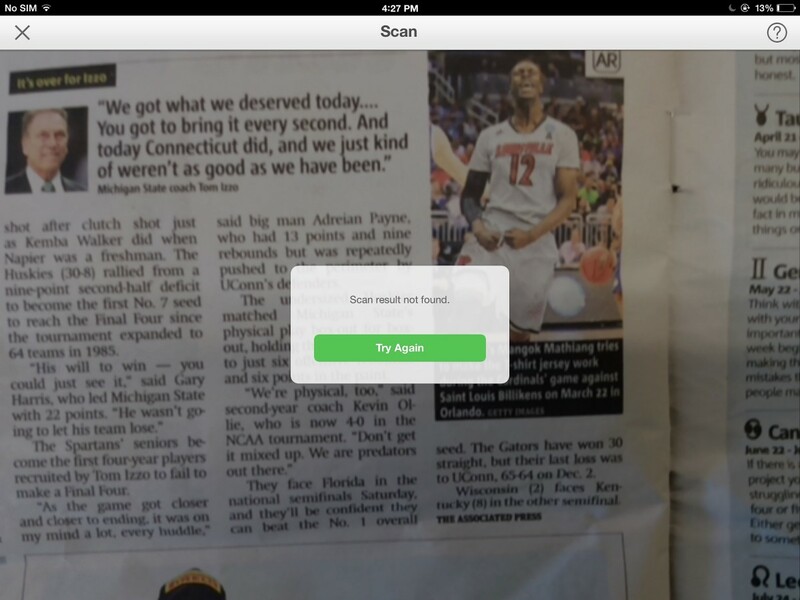 A newspaper reader must open an app, tap on the screen (in at least some apps), hover their device over an image, get a successful scan and wait for digital content to be loaded from a computer on the Internet. This multistep process for obtaining digital content may be acceptable when all the steps work rapidly and seamlessly, but not when one or more of them causes a bottleneck. Viewing augmented reality needs to be a "hover and see" process in order to attract people. If AR technology is improved, however—which it probably will be—its present applications could become exciting and new applications could appear. I hope the improvements come in time to help newspapers. I enjoy reading certain papers even when they have no augmented reality features and would be very unhappy if they disappeared. Hi, Eric. Thanks for the visit. I think that VR and AR are getting interesting, too. They have great potential. This sounds like a very interesting concept. I tend not pay too much attention to VR or AR but they are getting more interesting concepts and uses. Nice Hub. You're welcome, adevwriting. Thanks for the visit. I had heard of augmented reality navigation systems but never about newspapers. Thanks for sharing the info! Yes, augmented reality in newspapers is a bit like scenes in the Harry Potter movies! Thanks for the visit, travel_man1971. Wow! This is like in Harry Potter's movies, this augmented reality. And now it's happening in the USA and Canada homelands. I hope it reaches Philippines ASAP. Hi, Peg. It's very interesting when reality starts to mirror fiction! Thank you very much for the visit and comment. New technology on the leading edge. Wow. This is awesome. Glad to find your understandable explanation and learn of this. Thanks. It reminds me of the moving pictures on the Daily Prophet newspaper in the Harry Potter Series. Fiction does stimulate new realities. Thank for the visit and the comment, Deb. Yes, the technology can be impressive! Wow, this sounds pretty impressive! Hi, WestelCS. You've raised a good point. The audiovisual capabilities of the electronic device do matter! Thanks for the visit and comment. AliciaC, that was very nice and pretty informative article. I guess there's just a little drawback that the quality of audio-visual services of the AR will be according to the device used. Otherwise, it's just another amazing invention human has ever made. Thank you very much, Martie! I appreciate your comment. New technology can be very interesting! Great points, Cynthia! Ordinary reality has great advantages! I love learning about new technology and thinking about the possibilities that it offers, but I must admit that sometimes thoughts like yours have passed through my mind. Thanks for the comment. Wow! I am totally stunned. Not in my wildest dreams I could foreseen augmented reality. Thanks for explaining this in such a way that even I can understand it, Alicia. Interesting hub Alicia, as I had not come across augmented reality before. Like most things it has good points and bad ones. But one of my concerns is that it is just reinforcing our dependency on smart phones. As you pointed out, not every one has one or wants one. I'm already fed up with social occasions where people just sit fiddling with their phones instead of actually talking to each other. Also can't we learn to love ordinary reality? Does it have to be augmented or virtual? Thanks for the visit and the comment, Flourish! Augmented reality is a fascinating topic. I'm interested in seeing whether it works in newspapers. What a fascinating topic, and certainly as smart phones grow in popularity it will become more popular. Your point about whether people will still want to read newspapers if they can get it all online is certainly a good one, however! Hi, androidfan. Yes, the requirements for using augmented technology may limit its use. These requirements will also enable a person to easily get their news online, so it does make one wonder if AR will be successful. It's still an interesting feature, though! The scope of this technology is limited. You need to have a smartphone or tablet with good camera handy and also you need to have a high speed internet connection at home to get this thing work. I don't think a lot of people is interested to get the advantage of this new technology. Hi again, Larry. Yes, as I say in my hub, it remains to be seen whether people will be interested in a newspaper with augmented reality - interesting thought the new feature may be - when they can get all their news online. Time will tell! Folks, I am missing something. If you have a tablet, couldn't you just receive a graphic that resembles a newspaper with the copy being the latest news. The newspaper might charge a subscription, as they would for this new product, which few people are willing to pay. I grant you the technology is interesting, but as a old newspaper reporter, I do not see this kind of paper being put together on a daily basis, video produced for it and then delivered from house to house. Online news has been the biggest problem for newspapers. Some gave too much copy away and thus lost circulation and advertising dollars. Others only offer a sample and get a small number of subscribers to view the newspaper either like an online post or as my old paper is doing, offering access to a PDF file. The technology is interesting, but the application and more important the need for the application escapes me. Thank you, WiccanSage! I appreciate your visit and comment. I agree - technology is amazing. Thank you very much for the kind comment, Nell! Thanks for the vote and the share, too. The latest technological advances are very exciting. It is fascinating to think about future developments! Wow, very interesting. I might have to actually get a smartphone or tablet or something. technology is amazing. Great hub. That's a good point, Crafty. I wonder what newspapers will come up with next! Thanks for the comment. Wow, this is a cool feature of a newspaper. I am imaging a Harry Potter newspaper in the future. With so many newspapers closing, I wonder what they will think of next to keep the paper business alive. Thank you very much for the comment, Faith. I appreciate the votes as well. I hope things are going well for you now and that you have a great week. Blessings to you, too! I have to say that I have not heard of this, or maybe I knew of it, but just did not know what it is called. I do know newspapers are having to come up with something, being many in my state have let go so many people and only publishing a real newspaper on certain days with all being on-line. Up and more and away! Thank you very much for the comment, Happyboomernurse. I appreciate your visit and all the votes! Great article about a technology I never heard of. At the present time I fall into the category of those who don't use a smart phone or tablet but may do so in the future, so it's good to know what's out there. Thanks for posting this well researched article. It was very interesting and I'm voting it up across the board except for funny. Hi, Bill. Thanks for the visit. I'm very interested in seeing how the technology evolves, too! I'm also interested in seeing whether the AR feature becomes popular with the public and increases newspaper circulation. Hi Linda. How interesting. To be honest I have never heard of Augmented Reality in newspapers. It sounds like a great idea. I don't get the daily paper anymore so this is news to me. I'll be curious to see how this evolves over the next few years. Hi, Liz. Yes, modern technology is often amazing! It can be very exciting, too. Thanks for the comment. It is amazing how far technology has come and what we can do with it. I haven't heard of this before! Thank you very much, ologsinquito! I appreciate the vote and the share as well as the comment. I've never heard of this until now. You have such a good grasp of modern technology. Voted up and shared. Thank you for the kind comment, Devika. I always appreciate your visits! Thanks for sharing your thoughts, Larry. Yes, in today's world we can often be inundated with information! We certainly need to be selective about the information that we examine in detail. A brilliant hub and so much more to think about here you always come up with such great topics. When do people find time to read so much material off their smart phones and tablets. I worked for 22 years on the same job. During the last few I had a television turned to CNN on my left,my computer in front of me and a stack of work on my desk. One daily job was to write a news capsule about the oil and gas industry. I had a service that highlighted the stories. I use the first paragraph, put a headline on it and a link to the paper. THose that had copyrights, I asked permission. I had few people call me and asked me to stop because Louisiana was not a prime interest and they were receiving 10 other newsletters on their phones. There are some good writers in the news media--but you have to read and not scan. It is not necessary that we all know or try to know everything. We just need to be aware and if working, concentrate on the job and not some interesting, but not a concern of your company, event taking place in another state. I am retired. I spend more time reading my morning paper than I use to. I watch the evening news and I read the headlines I get in my e-mail and follow up if needed. I am not uninformed, but I do not try to know everything. Just my 2 cents. I think we are still making pennies. Hi, truthfornow. Yes, newspapers are doing what they can to increase their readership. I hope they succeed! Thanks for the comment. This is very interesting. Whatever attracts more readers huh? I know that newspaper readership is on the decline and so newspapers are doing what they can to change it up and attract people who are addicted to their phones and social media. Hi, Maren Morgan. Thanks for commenting. AR is an interesting development. It remains to be seen whether it alters newspapers as we know them and improves their circulation or whether it has no effect on their decline. Hi, Larry. Thanks for the visit and the interesting comment. The state of many newspapers at the moment is sad. I hate to think of them dying, but I understand what you are saying about rescuing them with something that may not be needed or may not be widely accepted by the public. It will be interesting to see how consumers react to the presence of augmented technology in newspapers as the technology improves. Wow. And I still miss plain clack and white for the daily paper. I am an old newspaper reporter. We told our stories with words and still pictures. The advantage was you could deliver the paper by throwing it in the yard and the only thing the consumer needed was the ability to read. Newspapers are dying. That is unfortunate because while the Internet may give us the national and international news (often in excess), the internet is not going to put the names of the people who made the Honor Roll at school, detail stories about high school football teams, pictures of the homecoming queens, actions of the city council, school board, etc. I live in a faily large city and we have one daily newspaper. It does a good job, but not great because of space limitations resulting from a decline in advertising. I am not going to hook up all the gadgets just to see a moving picture on my newspaper. This is an example of technology doing something that is not really needed. Hi, Audrey. 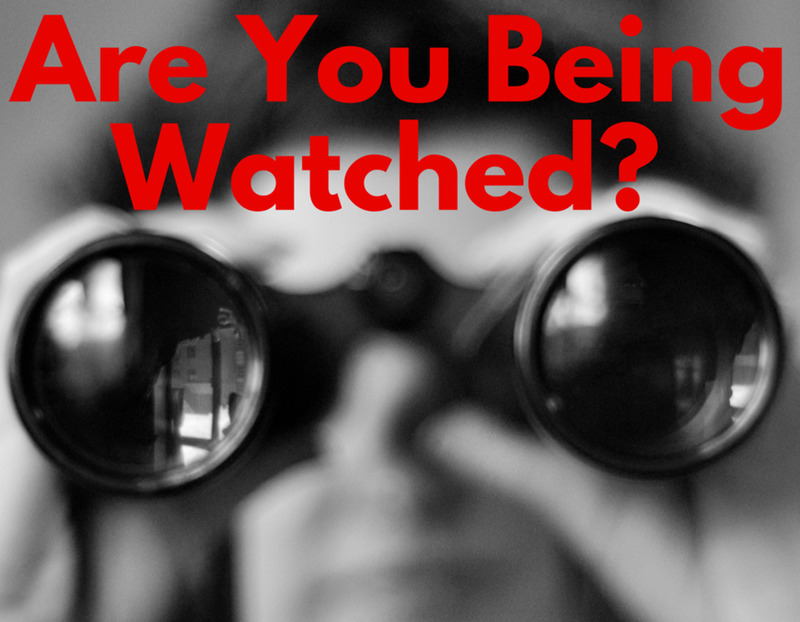 Yes, I'll be watching for new developments, too! 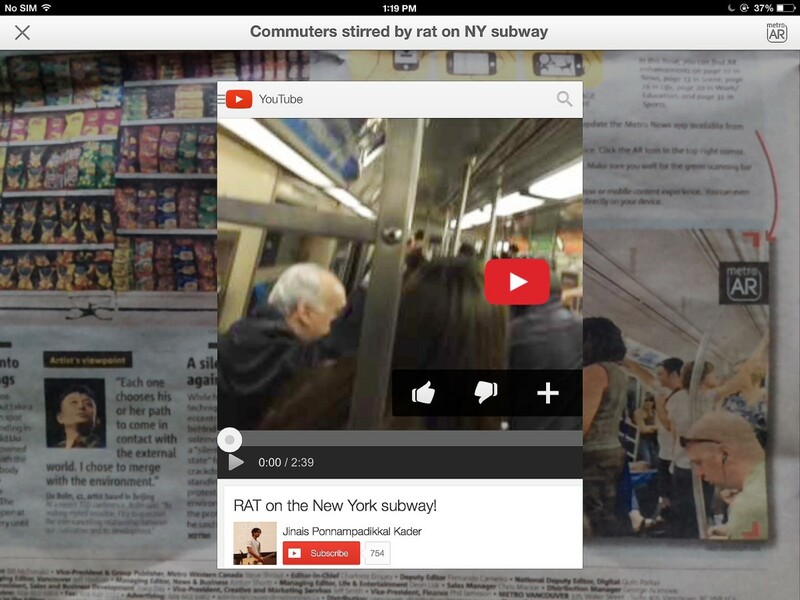 Using AR in newspapers is an interesting topic. Thanks for the comment. Hi, susi10. Yes, I think we are heading into some exciting times for augmented reality! I'm very interested in seeing how the technology progresses. I'm looking forward to reading your Google Glass hub. That device certainly has potential! Thank you so much for the kind comment, the votes, the share and the link. I appreciate them all! I hope you're having a very happy Easter. Wow, I have never seen this yet but it sounds super interesting. You have done a great job on this hub and I thoroughly enjoyed reading it. Voted interesting, useful and shared. Linked to this from my Google Glass hub. Happy Easter! Happy Easter, Bill! Thanks for the visit. Although I read news on the web, I enjoy reading newspapers as well. Getting a new edition of a good newspaper is very satisfying. There is something special about turning the pages of a paper and discovering new things! Change continues, doesn't it my friend? I wonder if newspapers will even exist in ten years? I wonder if there will always be dinosaurs like me who enjoy thumbing through real pages of print? Oh well...Happy Easter! Thanks for the visit, Rebecca. Print newspapers do need something to increase their popularity. Hopefully augmented reality will do the trick. Hi, Pamela. Thank you very much for the comment! Yes, AR should improve and become very interesting in the next few years. What'll they think of next! I would imagine AR is good news for the newspaper industry as they have had to compete with online newspapers. Thanks for letting us hear about augmented reality. I am another that has not heard of this technology before. You did a wonderful job of explaining all the details concerning AR technology. This sounds like something that will become more refined in the near future. Very interesting hub! Hi, Jodah. I appreciate your comment and the vote! 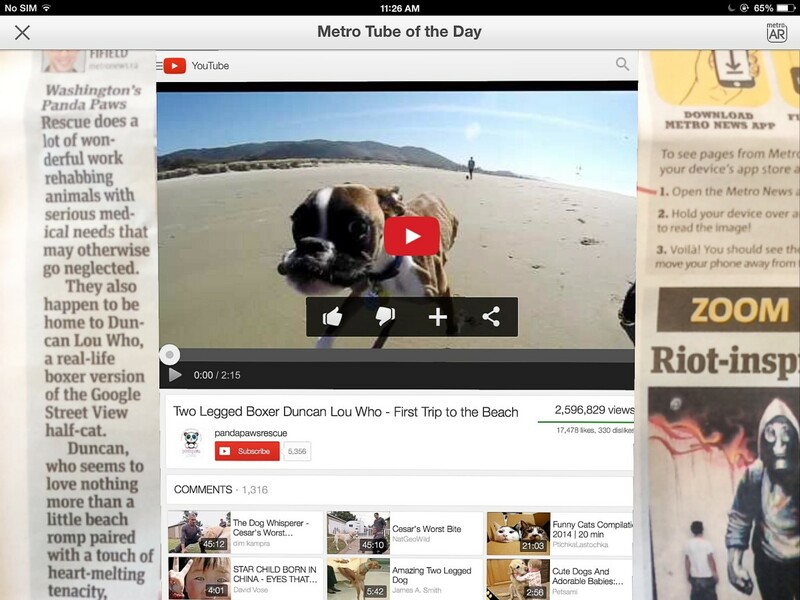 The second video actually talks about the use of newspaper AR in Australia, but I don't know if the technology is currently being used in Australian newspapers. Thank you very much, Vellur. I agree - augmented reality is a great feature, although as is the case for some other aspects of technology it does bother me that not everyone who wants to can access it. Wow, this is amazing technology. I'm also surprised it has been around for a couple of years. I haven't heard of 'augmented reality' either, but then I haven't looked at a newspaper for quite some time. We are usually a few years behind here n Australa though, so I doubt any of our newspapers are using it yet...but who knows. Voted up. Augmented Reality is a great feature but as you have mentioned not everyone can access it. It is definitely like in the Harry Potter movies. Great write, interesting and informative. Hi, Rachael. 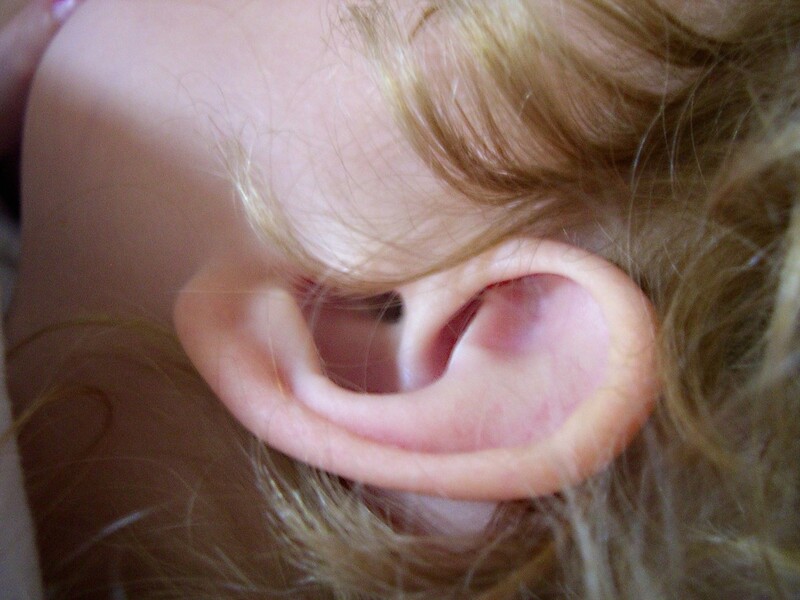 Don't feel bad about not hearing about augmented reality before! AR has been around for a while, but the pace of research and advances in technology have increased quite recently. I suspect that many people have never heard of augmented reality, or if they have, haven't thought much about it. I think that many people will become familiar with the topic in the near future, however! Thank you very much for the visit and the comment. Alicia, at the risk of appearing dumb, I have to say I have never heard of this before. I mean, I know about reading newspapers and magazines on the internet with links to videos, but to have a real newspaper to hold in my hand, to be able to view moving pictures is something I've never heard of. I've concluded that I must be very far behind the times because after I read your excellent hub which explained AR perfectly, the suggested (related) hubs I clicked before coming back to leave this comment - had articles dated as far back as October 2012! I guess I'm just surprised that I've never heard of AR, given the amount of time I've spent on the internet in the past year or two.